Sometimes we need to create copies of a database when we migrate a database from our testing environment to Production or maybe when we want to create a new database based on a template database. Or sometimes to test the database and make some experiments without affecting the production database or to have a replica to reduce the overhead or for security reasons. In Azure, it is possible to create Azure SQL database copies between Azure SQL Servers. If you have an Azure AD authentication, it can be a straight forward process. However, if you use a SQL Authentication, you may require additional steps. In this article, we will show some tips to migrate Azure SQL logins and users between different Azure SQL Servers using the portal, Cloud Shell and T-SQL. We will first copy a database with a login from a source Azure SQL Server to another. This is because the logins are stored in the master database. That is why, if you need to migrate the logins, you may need to migrate them separately. Basically, the T-SQL query will generate CREATE LOGIN sentences with the same password for each user. The query shows all the logins of type SQL Server (type=’s’). You will need to copy the results of the query and execute the sentences in the target server to generate the logins. Note that the option MUST_CHANGE used to change the password is not supported in Azure SQL. To avoid this problem, you can create contained database users. In the next section, we will show how to do it. In a contained database, the database users can login directly without a SQL login. You can have a database user with a password. If you create contained users, when you copy a database from a source to a destination, you do not need extra effort to copy the logins separately. If you want to automate administrative tasks, the Cloud Shell will help you a lot. Now, you can run bash to automate your tasks and this year you will also be able to run PowerShell using the console. With bash, you can automate tasks using the command line. As we explained in a previous chapter, you do not need to install the Azure Client in the local machine to run the Cloud Shell. Azure now allows you to run the Shell using the Azure Portal. az sql db copy is the command to copy an Azure SQL database. Azdbcopy is the name of the copy in the destination database. Mynewgp is the name of the source resource group where the source Azure sql database was created. Sqlshackserver is the name of the Azure SQL Server Source. Group1 is the name of the target resource group. Finally, sqlshackdestination is the name of the target Azure SQL Server where we will create the database copy. 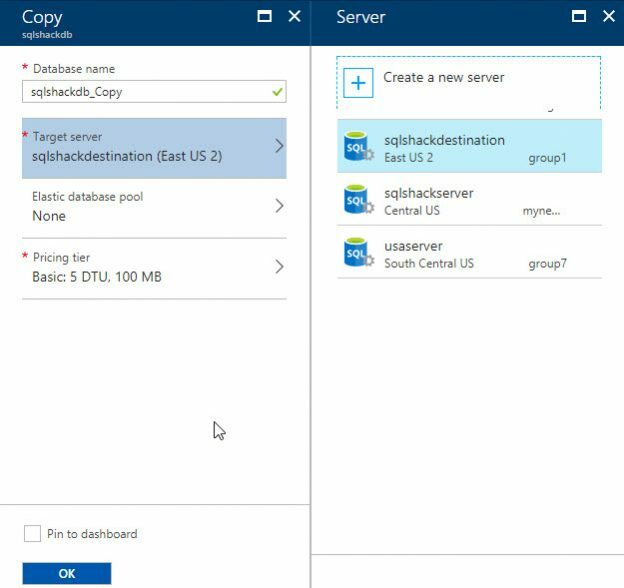 Where tsqldatabasecopy is the destination database and sqlshackserver.sqlshackdb is the name of the Azure SQL Server and the Azure SQL Database name separated by a “.”. In this article, we learned how to create a copy of an Azure SQL database using the Azure Portal, the Cloud Shell and T-SQL. We also learned how to create contained users to avoid the problems to migrate logins from one Azure SQL Server to another. We also create a query to generate code to create Azure SQL logins to manually create logins in the destination Server. The Azure Portal is a powerful and effective medium to manage your SQL Azure databases. I hope this article helps you understand how to utilize it more effectively, for common tasks like moving databases.